The first quarter of 2017 is now behind us, and although we won’t have complete economic data for a while, we do know that domestic stocks had a solid start to the year. Last week, major indexes took a pause from some recent gains and began the second quarter of 2017 with less than thrilling performance. The S&P 500 lost 0.30%, the Dow was down 0.03%, the NASDAQ gave back 0.57%, and the MSCI EAFE declined 0.72%.1http://finance.yahoo.com/quote/%5EGSPC/history?period1=1490932800&period2=1491537600&interval=1d&filter=history&frequency=1dhttp://finance.yahoo.com/quote/%5EDJI/history?period1=1490932800&period2=1491537600&interval=1d&filter=history&frequency=1dhttp://finance.yahoo.com/quote/%5EIXIC/history?period1=1490932800&period2=1491537600&interval=1d&filter=history&frequency=1dhttps://www.msci.com/end-of-day-data-search For this week’s update, we’re going to examine what happened to markets in the first quarter. 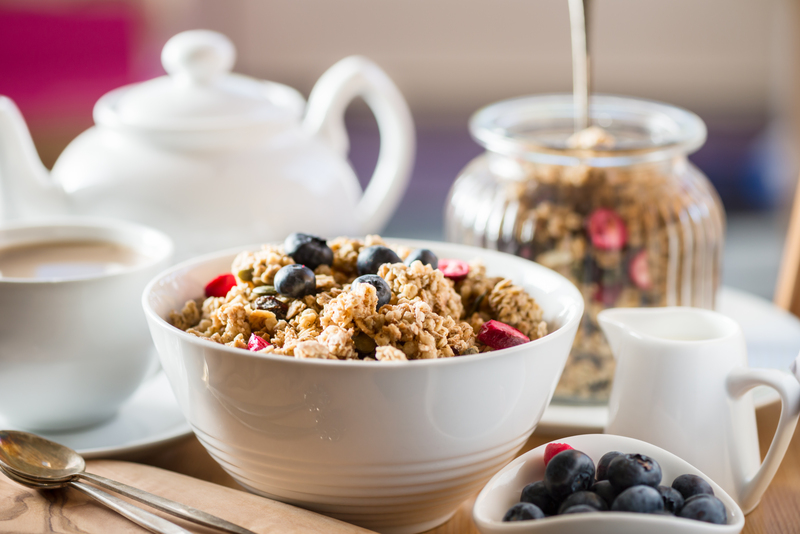 Boost your breakfast with this easy, homemade cereal! Servings: Makes about 5 cups. Set oven to preheat at 350°F. Combine the apple juice, honey, brown sugar, oil, vanilla, cinnamon, and salt in a large bowl. Add oats, almonds, and pecans to mixture. Toss all ingredients until they combine well and become thoroughly moistened. Take out 2 baking sheets and divide mixture between them. Place sheets in oven and bake until granola turns a light golden brown (roughly 15 – 18 minutes). Shake the pans occasionally as they bake. Remove baked granola from oven and pour into a large bowl. Cool granola completely and store in airtight container for up to 1 week. As an employee, you may end up making out-of-pocket purchases to support your workplace responsibilities. When you do so, you may be able to deduct some expenses. Here is further guidance to help you manage employee business expense claims. Is there any limit on how much you can claim? Typically, yes. You’re able to deduct employee business expenses that total more than 2% of your adjusted gross income. No. The IRS has rules for the type of employee business expenses you can claim. The expenses must meet two criteria for your workplace responsibilities: be ordinary and necessary. What are common expense examples? Any clothes or uniforms you must wear at work and not for everyday use. Any tools or supplies you need to do your job. Education that supports your role at work. Travel for work that takes you away from your home. To claim your expenses, you will need to file Form 2106, Form 2106-EZ, or IRS Schedule A. You can find further information on the IRS website. *This information is not intended to be a substitute for specific individualized tax advice. We suggest that you discuss your specific tax issues with a qualified tax advisor. When you’re driving the ball, is your angle of attack too steep? If so, you may be sacrificing distance and creating those awful pop-ups everyone wants to avoid. Unlike other clubs that require shallower angles of attack as the shaft gets longer, with a driver, hitting up on the ball is a good idea. However, players often let the driver head get too far in front of the ball before making contact. You can beat this bad habit with a surprisingly simple tool: a ball sleeve. Place a ball sleeve 12 inches in front of your ball. Aim to create an upward angle of attack as you swing while completely missing the ball sleeve. Angle your head so it leans backward behind the ball, which enables you to create a shallower attack and ascend into the ball. After trying this technique, you should find that you hit the ball farther and harder—and avoid those annoying pop-ups. Migraines can make life challenging, as the debilitating pain keeps you from being able to do simple things, like even opening your eyes. For those who suffer from migraines, a variety of medications are available to help control the problem. However, you can take your care a step further by making some life changes that may help you lessen their frequency and intensity. Create a Regular Sleep Schedule: Going to bed at different times each night and for different lengths can trigger headaches. You can help avoid this effect by creating and sticking to a consistent sleep schedule, even during weekends and holidays. Get Frequent Exercise: Studies suggests that those who get regular, moderate aerobic exercise can decrease frequency, length, and intensity of their migraines. Don’t Skip Meals: Regularly eating will help avoid drops in your blood sugar, which can trigger headaches. You’ll also want to stay hydrated. Get Complementary Care: Treatments such as massage, acupuncture, and talk therapy can deepen your care and work alongside your lifestyle changes and medications. Minimizing the waste you produce starts with minimizing your consumption. While some people choose to go all the way to a near “zero waste home”—where they live in a manner that doesn’t produce any extra waste—you don’t have to take such extreme measures in order to go green. Here are a few ways you can reduce waste in your home and create happier families (and landfills). Eliminate Disposables: Products like plastic sandwich bags and paper towels may be convenient, but they add to the waste you produce. You can swap your disposable items for durable alternatives, such as stainless containers for sandwich bags and washable rags for paper ones. Give Life to Leftovers: Food waste is a big problem, and you can decrease this in your home by choosing to reinvent your leftovers into new meals instead of tossing them. Buy in Bulk: Rather than purchasing small quantities—and taking home new containers each time—start buying household items in bulk. At certain stores you can find bulk options for everything from food items like nuts and beans to household products like shampoo and conditioner.